The Nautilus E614 Elliptical is brought to you by a brand who’s name is synonymous with both innovative exercise equipment and quality. This great-looking elliptical is very new to the market and it’s incorporating all of the most cutting-edge design and technology available. The star of the show is Nautilus’ freshly designed DualTrack™ LCD monitor with a large display and a small secondary display . The idea with these dual displays is that you can prop up a book or iPad over the main display and still view your workout data on the smaller one below. This Nautilus elliptical is stabile and durable with a 300 lb weight capacity. The frame comes with a 10 year warranty but it’s a workhorse will likely outlast that. Nautilus doesn’t stop there. The Nautilus E614 Elliptical is equipped with great features for a machine in this price range. You get all the normal stuff: a fan, a water bottle holder, etc. But you also get a media tray with charging capability and a computer that allows you to download exercise data in order to track your performance from workout to workout. You’re typically going to need to spend a couple hundred dollars more to get a lot of the options that come standard on the Nautilus E614. Click here to check the price of the Nautilus E614 Elliptical Machine on Amazon. 9 profile programs including 3 fun rides, 3 mountain rides, and 3 challenges. Nautilus does not sell and ship their products directly, but they are available through online retailers like Amazon. The Nautilus E614 Elliptical comes with a step-by-step, fully-illustrated manual and tools to assemble the machine. Note, you’ll need a few basic tools of your own to complete the assembly. Some users report that it takes around an hour to assemble the elliptical, and other a little more time. Either way, assembly is not difficult. *Note, at 167 lbs, the E614 weighs as much as an adult man. So to make life easier, have the delivery guy bring it to the room you’re going to assemble it in. Headquartered in Portland, Oregon, Nautilus has been revolutionizing the fitness industry with brands like Bowflex, Schwinn, Universal and Nautilus for over 40 years they Through the Nautilus® brand they produce full lines of upright bikes, recumbent bikes, elliptical and treadmills. First, there aren’t many brands better than Nautilus when it comes to fitness equipment. They’ve been doing it since the 1980’s, when the name became synonymous with working out. Secondly, this machine just looks great. It looks and feels like a very modern piece of exercise equipment. In the Nautilus E614, you are getting a strong piece of exercise equipment. Even with users approaching its weight capacity of 300lbs, it’s has a perimeter weighted flywheel that’s going to keep the machine well balanced during the most intense workouts. To round that off, the E614 comes with a 10 year warranty on its frame and is sure to last well beyond that. In our opinion a good computer on a higher end elliptical is right up there with overall design quality. A display with good features will take your exercising routine to a new level of enjoyment and usefulness. This elliptical comes loaded with 12 pre-programmed workouts. You just need to jump on, push a button and voila! You have an intense workout designed for you. No need to make up your own routine, although you do have that option. This best thing about this computer, however, is that you can download your workout data. Using Nautilus Connect and MyFitnessPal, you can download and store your statistics in order to track your performance from workout to workout. The only thing to note is that the elliptical’s six (6) levels of incline are manually adjusted. With a manually adjusted system you have to stop your workout (for a few seconds) in order to change the incline. It’s not really a big deal, and keep in mind that some elliptical machines in this price range don’t offer incline at all. Overall, whether it’s manual or powered adjustable incline, it’s is a very nice feature as it allows you to increase your intensity and put more focus on your upper leg muscles. 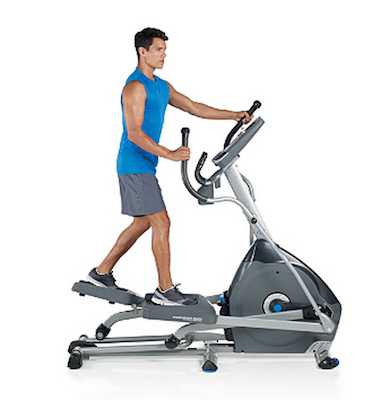 For well under $1000, the Nautilus E614 Elliptical is well worth the money. You are getting the quality that you can only find in a superior exercise equipment manufacturer like Nautilus and at a great price. This elliptical machine is modern, strong, and durable and will stay stable during your most intense workouts. With great warranties and a ton of high end features, this is a solid buy.